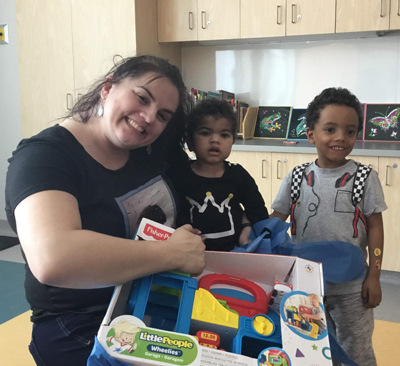 In Noah’s case, the three-and-a-half year-old’s experience with Kaitlen and countless volunteers at the JFK Sibling Park was truly life-changing for the whole family. His mother, Valerie Harvey, gave birth at 35 weeks in September 2017 to his brother Logan, who required a 16-month long hospitalization in the Neonatal Intensive Care Unit (NICU) due to a malformation of his esophagus. 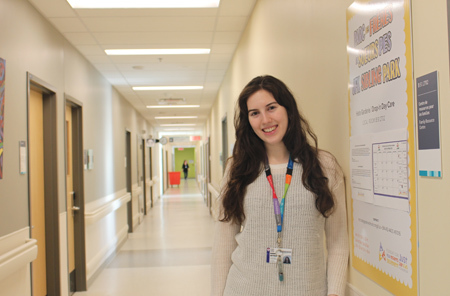 While Noah attended daycare during the week, Valerie says she felt an additional stress when the weekend would come knowing she would need to arrange care for Noah if she wanted to visit her new baby in the hospital. Over the 16 months his brother was hospitalized, Noah forged incredibly strong bonds with the volunteers and with Kaitlen. 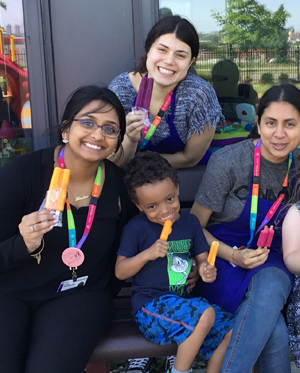 “Coming to the hospital every weekend and participating in the amazing activities they facilitated really allowed Noah to feel like he was part of the whole experience,” says Valerie, who laughs that he loved the experience so much, he much preferred going to the JFK Sibling Park to his regular daycare. What’s more, the Park allowed Noah and his parents to connect with other siblings and families going through a similar experience. The friendships they created were instrumental to their journey, says Valerie, and she still connects with other families today, almost three months after Logan was discharged home. “I don’t have the words to express how grateful I am,” says Valerie about her experience. “For 16 months we couldn’t go on vacation, we couldn’t go on day trips, we couldn’t bring Noah on outings. He was only able to physically see his brother a total of six or seven times. It was really hard. And he really wanted to be with us. This program allowed us to keep our family together, and I can’t think of anything more valuable.